Cut Nyak Dien Biography Biodata and Profile Cut Nyak Dien Blog where familiar figures and famous people in the world. to increase our knowledge of science is also motivated to take the side of Heroes Indonesia Positive Cut Nyak Dien, plainly how his journey in the fight whether bangasa Indonesia and what he did for Indonesia to be closer And then know then let us know closer to Cut Nyak Dien Indonesia as a national hero. Cut Nyak Dien was born in Lampadang, Kingdom of Aceh, 1848, a National Hero of Indonesia from Aceh who fought against the Netherlands during the war in Aceh, Cut Nyak Dien was born from a noble family who are religious in Aceh Besar, Mukim VI region in 1848. His father was Teuku Nanta Setia, a uleebalang VI Mukim, who is also a descendant Machmoed Sati, migrants from West Sumatra. Machmoed Sati may come to Aceh in the 18th century when the Aceh sultanate ruled by Sultan Jamalul Badrul Munir. Therefore, the father of the Cut Nyak Dien is a descendant of Minangkabau. Cut Nyak Dien's mother was the daughter of uleebalang Lampagar. In his childhood, Cut Nyak Dien was a beautiful child. He was getting an education in the field of religion (who was educated by parents or teachers of religion) and household (cooking, serving her husband, and that everyday life involves a well educated by their parents). Many men who like the Cut Nyak Dien and tried to propose to her. At age 12, she was married off by her parents in 1862 with Teuku Check Lamnga Ibrahim, son of uleebalang Lamnga XIII. They have one son. "Look O Acehnese!! Place of worship being destroyed!! They have mencorengkan name of Allah! Until when are we here? Until when are we going to be slaves Netherlands?" Sultanate to win the war first. Ibrahim Lamnga who fought on the front lines again with shouts of victory, while Köhler was shot dead in April 1873. In 1874-1880, under the command of General Jan van Swieten, region VI Mukim be occupied Netherlands in 1873, while the Sultan Palace fell in 1874. 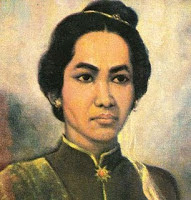 Cut Nyak Dien and her mother eventually fled with her ​​mother and the other party on December 24, 1875. Her husband later fought to reclaim areas Mukim VI. When Ibrahim Lamnga fought in Gle Tarum, he died on June 29, 1878. This makes the Cut Nyak Dien very angry and vowed to destroy the Netherlands. Uma, hero Aceh, Cut Nyak Dien apply. Cut Nyak Dien Initially rejected. However, because Uma motioned to engage in battle on the battlefield, Cut Nyak Dien finally accepted and married Uma in 1880. This makes the growing moral fervor Aceh struggle against Kaphe Ulanda (Dutch infidels). Later, Cut Nyak Dien and Uma had a son whom they named Cut Xylophone. Continued the guerrilla war waged war and fi'sabilillah. Around the year 1875, Uma movement with the Dutch approach and its relationship with the Dutch getting stronger. On 30 September 1893, Uma and his troops numbering 250 people went to Kutaraja and "surrender" to the Dutch. Dutch are very pleased that a dangerous enemy willing to help them, so they provide a degree Uma Uma Johan Heroes and making the unit commander of the Dutch troops at full power. Uma conceal a plan to deceive the Netherlands, though he was accused of being a traitor by the people of Aceh. In fact, Cut Nyak Meutia came to Cut Nyak Dien and cursing him. Cut Nyak Dien tried to advise him to come back against the Netherlands. However, Uma still kept in touch with the Dutch. Umar then try to learn the tactics of the Netherlands, while slowly changing as many Dutch people in the unit are the strongest. When the number of troops in Aceh is sufficient, Uma conduct fraudulent schemes in the Netherlands and claimed that he wanted to attack a base in Aceh. Uma and Cut Nyak Dien away with all the troops and heavy equipment, weapons, and ammunition Netherlands, and has never returned. The betrayal is called Het verraad van Teukoe Oemar (Uma betrayal). Uma who betrayed the Netherlands led the Dutch furious and launched a massive operation to capture both Cut Nyak Dien and Uma. However, the rebels are now equipped with equipment from the Netherlands. They began to invade the Netherlands while Jend. Van Swieten replaced. His successor, Gen.. Jakobus Ludovicius Hubertus Pel, quickly killed and Dutch troops are in disarray. Netherlands and unplugging Uma titles and burn his house, and is also pursuing its existence. Dien and Umar continued to pressure the Netherlands, and attacked Banda Aceh (Kutaraja) and Meulaboh (former Uma basis), so that the Dutch constantly changing generals in charge. Units "Maréchaussée" and sent to Aceh. They are considered barbaric and extremely difficult defeated by the people of Aceh. In addition, most of the troops "De Marsose" is the Chinese-Ambon that destroys everything in its path. As a result of this, the Dutch troops feel sympathy for the people of Aceh and Van der Heyden dissolve unit "De Marsose". The incident also led to the success of the next general because a lot of people who did not join the jihad lost their lives, and the fear is still there on the Acehnese. "As women in Aceh, we should not shed tears in people who have a martyr"
Cut Nyak Dien then led the resistance against the Dutch in the hinterland Meulaboh with small forces and try to forget him. These troops continue to fight until its demise in 1901 for the Dutch army was used to fight in the battlefield area of ​​Aceh. In addition, Cut Nyak Dien'm getting older. Her eyes had started to dim, and he was exposed to the disease gout and also the number of troops continued to decrease, and the difficulty of obtaining food. This makes pity the its forces. Cut Nyak Dien men named Pang Laot report the location of its headquarters to the Netherlands because of pity. As a result, the Dutch attacked the headquarters in Beutong Cut Nyak Dien Le Sageu. They were shocked and fighting to the death. Cut Nyak Dien captured and brought to Banda Aceh. Dien moved to Sumedang berdasari last person to protect Dien until his death. However, Cut Nyak Dien has a myopic, so he was caught. Dhien trying to take rencong and tried to fight the enemy. Unfortunately, the action Dhien been stopped by the Dutch. Cut Xylophone managed to escape into the woods and continue the resistance that has been done by his father and mother. Once captured, Cut Nyak Dien brought to Banda Aceh and treated in situ. Arthritic disease such as blindness and gradually recover. However, Cut Nyak Dien finally disposed Sumedang, West Java, Dutch fear that his presence would create a spirit of resistance and also because he kept in touch with fighters who have not been subject to.